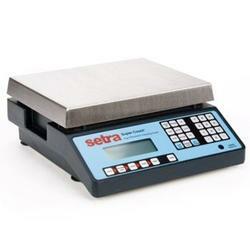 The Super Count couples the benefits of Setra’s high resolution ceramic sensor with and intelligently designed, full-function keyboard to deliver a high accuracy, easy-to-use counting scale at a surprisingly moderate price. 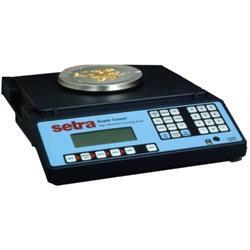 The proprietary variable capicitance weighing technology lets the scale display weight changes as minute as 1 part in 125,000. The internal resolution, which is four to ten times greater than the display readability, assures the most accurate counts. Each of the seven weighting capacities has been carefully designed to protect the sensor from overload and shock. The heavy duty construction and full two year warranty assure consistent performance even when subjected to rough industrial handling. Whether used for production weighing, inventory control, transaction processing, kitting or quality control, versatility and extremely high accuracy make the Super Count an exceptional value. Internal database allows storage of APWs and tare weights or the accumulated count for up to 256 part numbers. By simply keying in the part number, the Super Count immediately recalls the APW/tare weight or accumulated count and is ready to use. Programmable RS-232 output with ScriptCoder™ allows up to 10 custom label designs with barcodes to be printed on a thermal label printer.